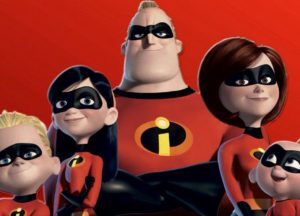 Picking up right where The Incredibles left off, Incredibles 2 reunites us with our favorite superhero family the Parrs. After an unsuccessful encounter with the villainous Underminer, Bob, Helen, Dash, Violet, and Jack-Jack must remain in hiding as superheroes are still considered illegal. Things begin to take a turn for the better as Bob, Helen, and life-long friend Lucius, aka Frozone, are sought out by telecommunication tycoon and superhero enthusiasts Winston Deavor who informs the trio he wants to help make supers legal again. As part of his plan, Winston insists on using Helen, also known as Elastigirl, as their go-to superhero to openly fight crime and win over the government. Meanwhile, Bob, aka Mr. Incredible, is tasked with his new mission of tackling normal everyday life and watching the kids in Helen’s absence. While the Parr’s learn to adjust to their new responsibilities, a new threat who calls himself the Screenslaver is out to ensure superheroes remain illegal and will stop at nothing to do so. It’s no wonder this sequel took 14 years in the making, as Director Brad Bird carefully made sure to give fans just want they have been waiting to see and was well worth the wait. Incredibles 2 does its predecessor justice in making sure the audience members are transported back to a time when they were first introduced to this dynamic superhero family, stirring up the right emotions when you watch this sequel. With almost everyone reprising their roles, the cast does an incredible job (no pun intended) putting their all into this movie and making it seem as if nothing has changed from when they had worked on the first film. Craig T. Nelson does an excellent job in reprising his role as Mr. Incredible and really brings out a more tender side of the macho superhero father who strives to be the best hero and father to his family. Any time he is on screen playing “Mr. Dad” are some of the films more hilarious and heartfelt moments that make this movie great. Especially when paired with Jack-Jack. Most of the newer characters introduced in the film also do a great job with keeping the film interesting, and the animation was stunning as per Disney Pixar standards. Let’s not also forget Samuel L. Jackson’s awesome voice performance as Frozone. However, that still goes to say that this film still has its problems and does not top the first film in any means. Although the action sequences seem a bit more lackluster than the first, there are still plenty of fight scenes that will give audience members something to look forward too. The plot at times did feel a little predictable but did not take away from the enjoyment of this film. A solid sequel and Disney Pixar movie, Incredibles 2 is an enjoyable and fun film that was surely worth the wait.